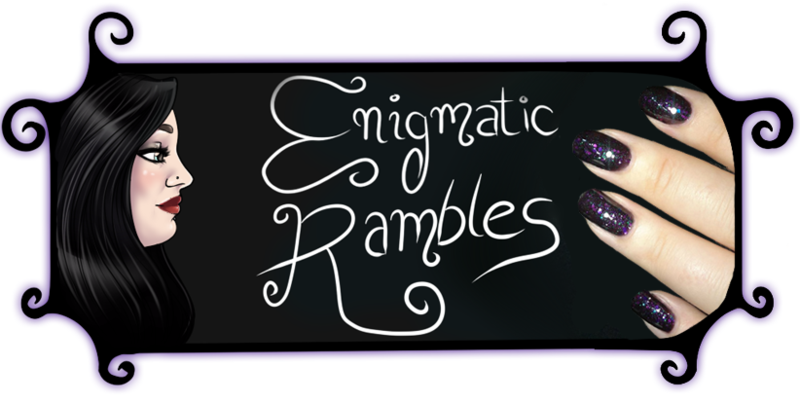 Enigmatic Rambles: What is in my Stamping Bag? 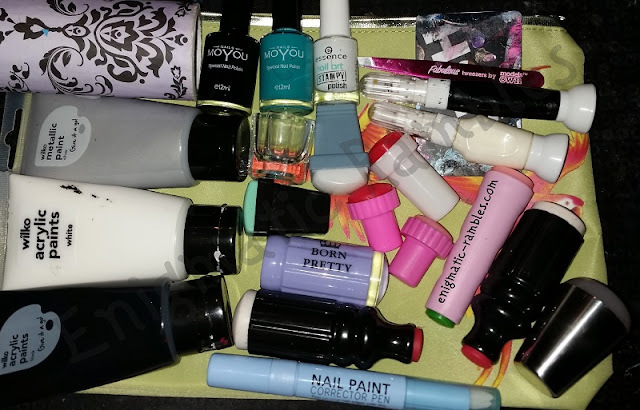 Today I am sharing what is inside of my nail stamping bag, it doesn't have my plates in or all of my stamping polishes. Just my go to stamping kit. I use this for cleaning off my stampers, it doesn't damage the heads the way acetone does. I really like the black one, the Persian Turquoise one isn't as opaque though. 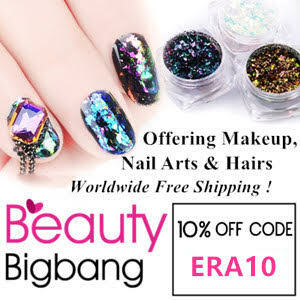 Again I really like this one, it is opaque and a bargain price. Not so impressed by the silver one but the black and white are really good and again are a great price. I use this for scraping, prefer it to metal scrapers. I got these free a long time ago. I use them for holding cotton wool balls which have been dipped in acetone so I don't end up messing up my nails pinching it with my fingers. I don't tend to use these too often but these colours are the ones I reach for most often when I do. This is for acetone, for clean ups. For clean ups again, I keep forgetting I have this. It is good though if you don't want to go down the acetone / brush route. Excessive yes, however since I began stamping in 2010 technology has moved on and now there are more squishy heads, jelly heads, see through heads all so much easier to use than the first line Konad style one.